Objectives: Coalition formation is known from a number of mammals including hyenas, wolves, lions, cheetahs, coatis, meerkats, and dolphins. In primates, both kin and non-kin, and both within-group and group-level coalitions are a powerful means of increasing reproductive success, either through direct competition over food or mates or via achieving high dominance status by means of coalitions. This is what makes primate rank-orders so complex and explains why scientists speak of "politics." In humans, coalitions occur at many different levels (ranging from within-family to between-nation states) and represent probably the most dominant factor in social organization throughout human history. In spite of their importance for biological, social and cultural evolution, our understanding of how coalitions and alliances are formed, maintained, and break down is limited. Existing theoretical approaches for studying coalitions in animals are often rooted in cooperative game theory, economics, and operations research. These approaches are usually limited by consideration of coalitions of two individuals against one, focus on conditions under which certain coalitions are successful and/or profitable and the assumption that individuals are able to evaluate these conditions and freely join coalitions that maximize their success. As such, models typically do not capture the dynamic nature of coalitions and/or are not directly applicable to individuals lacking the abilities to enter into binding agreements and to obtain, process, and use complex information on future costs, benefits, and consequences of different actions involving multiple parties. These approaches do not account for the effects of friendship and bonding and the memory of past events. Within primatology these issues are often debated in terms of the cognitive complexity needed for reciprocal altruism, with some assuming high levels and others distinguishing among proximate mechanisms, not all of which are necessarily complex. Another complexity introduced in primate studies is that of the fission-fusion nature of many societies, which dramatically reduces the ability to predict which allies will be present on which occasions. The goal of this working group is to bring together empiricists and theorists to identify the most promising ways for building a testable quantitative theory of coalition formation. The focal questions to be answered by the working group are: What data are available? What modeling techniques are available? What are the empirical patterns that cannot be explained by existing theories/data? How can we adapt existing models to fully use available data? What kind of data are needed to better inform the models? What new modeling techniques and methods need to be developed? How do we demonstrate the existence of coalitions and alliances (what methods and statistics do we use)? What are the rules for the formation of coalitions (e.g. rules of recruitment and solicitation)? What are the benefits of coalitions and alliances (i.e. mating success, reproductive success, paternity analysis, goals, added value)? What are the general patterns in the dynamics of coalitions and alliances? The group members have initiated an online exchange of data, manuscripts, and ideas with the overall goal of gaining a better understanding of both existing empirical data and testable predictions generated by mathematical models. The next meeting of the group will take place Feb. 4-6, 2010. Meeting 2 Summary. The meeting started with presentations outlining different theoretical techniques used for modeling coalitions and alliances (including cooperative game theory, coagulation-fragmentation theory, games on graphs with dynamic linking, and information network theory). Group members also presented and discussed a number of empirical observations and patterns relevant to coalitions and cooperation in chimpanzees, capuchin monkeys, and humans as well as some "big questions" for empirical research for the next 10 years. The rest of the meeting was mostly focused on different ideas for joint projects/papers. One idea is to work on a review of existing modeling techniques and their limitations and advantages from the point of view of empiricists. Another is to focus on general empirical patterns and the kinds of data needed to better inform the theory. The third is to build a relatively simple model of coalition formation that can be studied using a variety of different theoretical techniques and simultaneously can be validated using empirical data on chimpanzees, baboons, and capuchin monkeys. From the joint discussions, one promising model emerged, and the group concluded that the most productive approach for now until the next meeting is to focus on development and validation of this model. The next meeting is scheduled for fall 2010. Meeting 3 Summary. The meeting started with progress reports on several projects initiated earlier. Specifically, we discussed a review paper on the theory of coalition and alliances, a project on modeling reciprocity networks, and a project on estimating individual and coalitionary strengths from observations of agonistic interactions and using these estimates to make predictions about individual and coalitionary aggressive behavior. 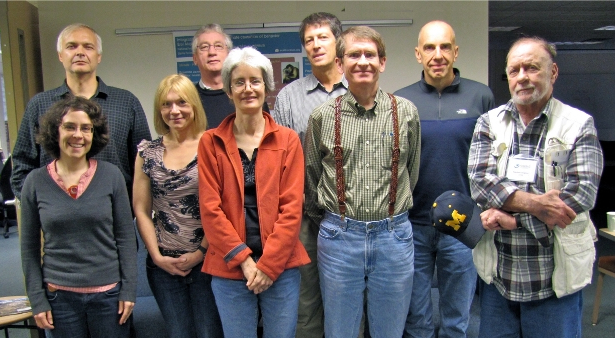 Then several new and old members of the group described some of their projects dealing with coalitionary decisions in Barbary macaques, chimpanzees, and humans. For the second half of the meeting, the participants split into two subgroups. One subgroup worked on an outline of a methodological paper discussing challenges of empirical work on coalitions and alliances and advancing some ways of answering these challenges. The participants agreed on Feb.14, 2010, as a deadline for having a good draft of the manuscript. The other group was exploring most fruitful directions for joint theoretical work. The discussion focused on theoretical attempts to understand partible paternity, on the dynamics of fission of Yanomamo villages, and on ways to improve the predicting ability of existing coalitionary models. The group as a whole did not see an immediate need for another meeting but the members will work on finishing various projects.